The wife licks her lips, stops a moment, looks at the far wall, and states “Nahhhh” after having a sip of Saisonette before walking away. Her loss I guess, because a 750mL bottle is designed to be shared. My gain then, because this is a great beer. The first thing that strikes me with any La Sirene beer is the bottle art, which is always sensational. In this instance, we have a long haired, robed female perched atop a small rock surrounded by what I assume is ocean, gazing in the distance towards my 4 o’clock. A more glamourous, artistic, Little Mermaid. Musty oak, apple and pear greet the nose as the vibrant straw liquid glows out of the glass, and the bubbles race to the top. The flavours are a kaleidoscope of this that and the other – straw, lime, floral, yeasty (especially as I disturbed the yeast at the bottom of the bottle, leading to lots of floaties). It’s sweet, with a dry finish, and the cabronation keeps it feeling light. Loving this beer. Its light and refreshing, and I’d be drinking it out in the sun if I hadn’t been sunburnt just two days earlier. And at 3.8% ABV it doesn’t tip me over the edge. Bravo to La Sirene, another quality saison in their stable. Smoked beers aren’t for everyone, but I for one love them, even though they’re a rare commodity on the market. The peated malts combine with some hops can give a beer a great, smokey flavour. 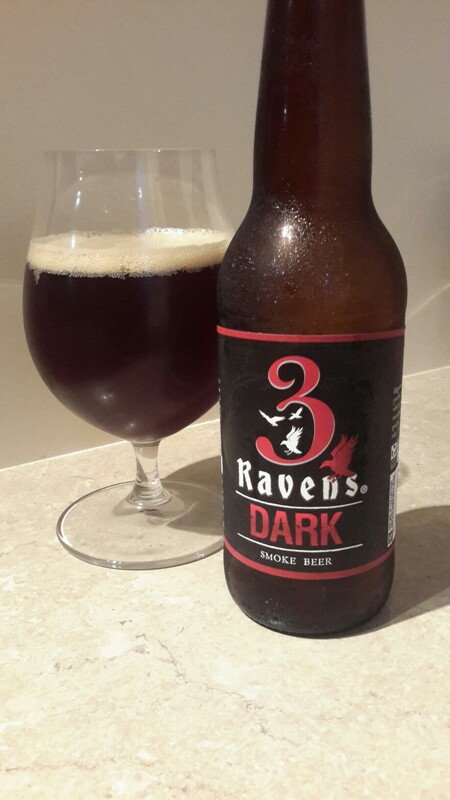 And so it was when a good mate gifted me a bottle from the brewery he works at – 3 Ravens. Based in Melbourne, their footprint in the NSW market is fairly small, meaning my exposure to them is limited. This is one of his favourites, so it’s got a bit of a reputation to stand up to. Dark (seems strangely named when spoken just like that. ‘Dark beer’ would work in a sentence much better) pours a cloudy brown, with big bacon aromas floating up off the liquid. It retains a smokey flavour in the mouth, but is also joined by a chocolate sweetness, which just about retains balance with the rest of the beer. It’s a little thin, which is my one criticism of it – something a bit more thick and chewy in the mouth would go down a treat. Or on nitro! Now there’s an awesome proposition! This is a quality drink which I’d highly recommend. It’s sweet, without being too sweet (just). It’s smokey, without being too smokey. It’s this flavour which is the real winner – it lingers for a long time in the mouth. Now off to find some more smoked beers! Hope Estate has forged a reputation for big concerts, with the current season seeing names such as Bruce Springsteen, Culture Club, and the Screaming Jets entertaining the masses. They also have a cellar door, which is the first thing you see when entering the main building. But walk a another 10m and you’ll find their glorious bar, with 12 taps of beer at the ready. The brewery arm was established in 2014, with the mission of creating the finest concert beer experience in the country. The building itself (which houses the brewery and cellar door) looks down the hill towards the stage – I’m yet to experience an event there, but it seems a decent slope on which to watch the stars do their thing. There’s a load of space inside the building proper – couches, long tables and an abundance of standing room for patrons, as well as an outdoor area. From a quick glance of the menu, it looks your fairly solid pub fare, with burgers and pizzas two items to catch my eye. looking lineup. Everything from a lager to a DIPA to a porter, they’ve got most bases covered. I’ve picked up a few growler fills from there, and they’ve only recently gotten into canning, which judging by my Instagram feed has increased their footprint tenfold. The beers are all of a top quality – I’m yet to have a bad one, with the IPA being the pick of the bunch according to my sensory glands. Maybe they could push the envelop more from a creativity perspective, as being connected to a winery I’m sure they have access to barrels, but hard to mark down if their not hitting the mark their given the overall quality of their beer. A hat tip to the area I now call home, Hunter Valley Good Beer Venues features pubs/bars/breweries which have a focus on craftier beer offerings. It also provides me with an excellent excuse to go to the pub, all in the name of research. Lists, best of’s, and worst of’s – the end of the year provides a time to reflect on what has been, and what might have been. Australian beer is no different in this respect, with GABS offering an opportunity for punters to vote for their favourite beers as part of the Hottest 100 Aussie Craft Beers poll. It’s come in for criticism recently, with some of the larger, arguably ‘non crafty’ players being included. They’ve been the benefactor of votes in the past based largely on the fact their ability to get the drinks on shelves and their distribution footprint is far greater than the smaller breweries, regardless of the quality produced. It remains to be seen whether this also occurs this year too – my thoughts are it will. I’ve opted to use the same criteria as I did for my vote last year – I’ve rated it at least four and a quarter stars on UnTapped, only beers I’ve consumed in the 2016 calendar year, and no festival beers unless consumed at another time. The app only let me scroll so far, but still gave me 13 beers to choose from, which is more than enough to whittle down to five. Bacchus Brewing Co – Peanut Brittle Gose: A gose is not a style I’m a massive fan of, but as GABS People’s Choice winner this year, it was bound to be good. I purchased it as a dessert beer for Christmas Day, and it didn’t disappoint (luckily, because at $19 a pop she’s not cheap). It had the gose saltiness, but this buttery and nutty flavour which rounded it out perfectly. Feral Brewing Company – Watermelon Warhead: Not a new beer by any means, but I was able to get my mittens on it for the first time at the Pourhouse in Maitland. Light, not overwhelmingly sour, and with a beautiful watermelon flavour swimming all the way through, this berliner weisse style beer is fantastic! Feral Brewing Company – War Hog: The can was a vessel which has picked up a big head of steam this year, but this is the only one in my top five. A hop bomb with a juicy mouthfeel, this was an awesomely refreshing drop. Akasha Brewing Company – Korben D. Double IPA: Shared a long neck of this with the better half, who also enjoyed it. Great flavour and wonderfully balanced for a DIPA, a style which can occasionally be overwhelmed by hops. Not this one. Haven’t spotted it since this single purchase, but not for a lack of trying. Wild Thing – Murray’s Craft Brewing Co: I had to get at least one local beer on the list. It’s a big, black beer, perfect for the cool months. I’m already looking forward to 2017’s version and its associated variants being released over the coming months. Honourable mentions – Feral’s Hop Hog, still a great beer, but either my tastes have changed or other beers are getting ahead; FogHorn Brewhouse’s Young Americans IPA, another local beer; Golden Stout Time out of Adelaide’s Big Shed Brewing Concern; and Sonic Prayer by Modus Operandi – a beer which first appeared in the latter half of the year, should get a spot in the top 50 based on the public’s response. On the outskirts of Cessnock is Potters Hotel, Brewery, Resort. It’s a big venue, which, as the name suggests, is home to a hotel, function centre, and a pub, which is always teeming with patrons on weekends when the tourist crowds drift into town in search of some new wine to add to the cellar. But the reason I was there was to visit the “brewery” part of the equation, which houses Hunter Beer Co (I have a feeling it used to be home to the now-defunct Bluetongue Brewery). Its a small operation, with brewery and tasting bar all in a space which could only be 30-40m long at best, and 10m wide. The bar has 10 taps, all of which pour Hunter Beer Co drinks, either the core range or seasonals. Beers come as samplers (for the bargain price of $1.50 for 200mL! ), or as schooners. There’s also tasting paddles and they do growler fills (a growler of their Bock went down very well that evening). The beers themselves are all quite good. The core range features a witbier, pale ale, kolsch, ginger beer, and lager. I quite enjoyed the witbier even though the dreary weather didn’t seem to match, while the better half preferred the kolsch. They had a handful of seasonals pumping, of which Cranky Pants is a big strong IPA, and there was a sour (who’s name escapes me), which was nice without being face-puckeringly so. I grabbed a bottle of their 2016 Big Stout, and have stashed it in the cellar for a later date. were all very friendly, and while there’s limited food options at the brewery itself, the pub is right next door and does good, honest pub-fare. There beers do pop-up at pubs around the Hunter Valley, so if you’re unable to make it to the brewery itself then there’s a chance you’ll stumble into something somewhere along the way. Go there…for cheap samplers, $1.50 is a steal! A hat tip to the area I now call home, Hunter Valley Good Beer Venues features pubs/bars which have a focus on craftier beer offerings. It also provides me with an excellent excuse to go to the pub, all in the name of “research”. The answer lies within the glass itself, the first of which is the “pale stout” equation. It’s pale alright, and an absolute stunner at that – bright, cloudy orange, with a smooth white head. Lovely stuff! On the nose there’s a whole whack of coffee, with the slightest of chilli undercurrents. In the mouth, coffee again is the strongest element, along with some orange, and a light coffee driven bitterness. The chilli is there, but it’s only very slight in both flavour and kick, unlike other chilli beers I’ve tried which set my mouth alight. It sits thin in the mouth which isn’t a characteristic of some of the better stouts, but this is no normal stout. Stockade Brew Co have thrown up a real doozy in this beer, with it giving off an appearance which is nothing like its flavour, but somehow retaining a solid balance of flavours throughout. For that the brewers certainly deserve some kudos. But for me, I’m not sure I’ll go back hunting for this beer. It’s good, no doubt about it, but I don’t know what this beer is trying to be, which makes me wonder when I would want to drink it again. If I want a refreshing pale ale-type drink, I’d prefer to get a stock standard pale ale. If I want a warming stout, I’d prefer a stock standard stout. But each to their own. GABS is frequently the birthplace of new beers to the market, especially those that push the envelopes of their style. The basic premise is this – each brewery attending the festival must create a new beer specifically for the festival. Occasionally, the breweries will bring their festival beer out as a limited release, which is the way I was able to get my mittens on Captain Amylase, Mountain Goat Beer’s entrant to the festival for 2016. To the eye this is a porter. Deep brown, off white puffy head which laces the glass down to its final drop. From here its certainly rum, rum, rum…and porter. On the nose there is this spirit scent, plus some roasted dark chocolate and vanilla. It’s a complex beer in the mouth, with rum flavours at the back of the mouth, sweet vanilla and coconut at the front, and a little smokiness all throughout from the roasted malts. It’s a fraction thin, but still very smooth to drink – I’d expect nothing less from a porter. As with most GABS’ beers, Mountain Goat Beer have really thought outside the square with this one. The porter character is straightforward, but it’s the addition of the rum which unsettles the apple cart. It works, and works even better as a winter warmer, but I’m not sure I’ll rush back to the bottleshop for another one. The rum is too strong, and slightly disrupts the balance of the beer mine. A good beer for sure, but not a winner for me.